Never miss a critical requirement again. 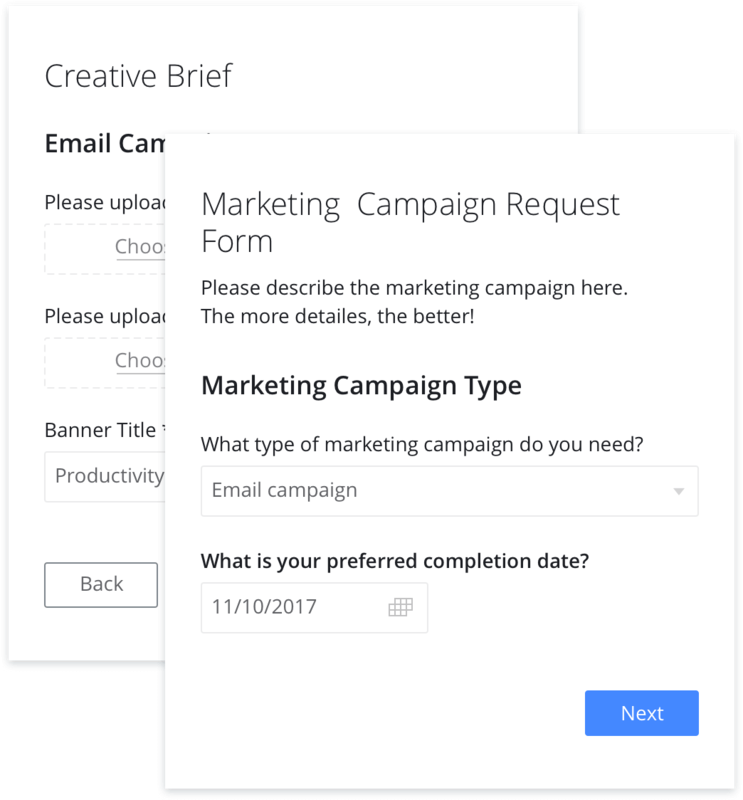 Collect complete requirements every time with a Dynamic Request Form, with tailored pages and questions based on customers' needs. Data can be saved to Task or Project Descriptions or custom fields. * Available for Business, Enterprise and Wrike for Marketers plans. Start a free 14-day trial now. When handling increasing or more varied Requests, easily scale by automatically creating a Project from a Template. The right Template is selected to match the customer's need, aligning the entire project with the customer's preferred start or finish date. Configure your workspace with your preferred Project templates, automatically creating initial Dashboards and Reports for you. 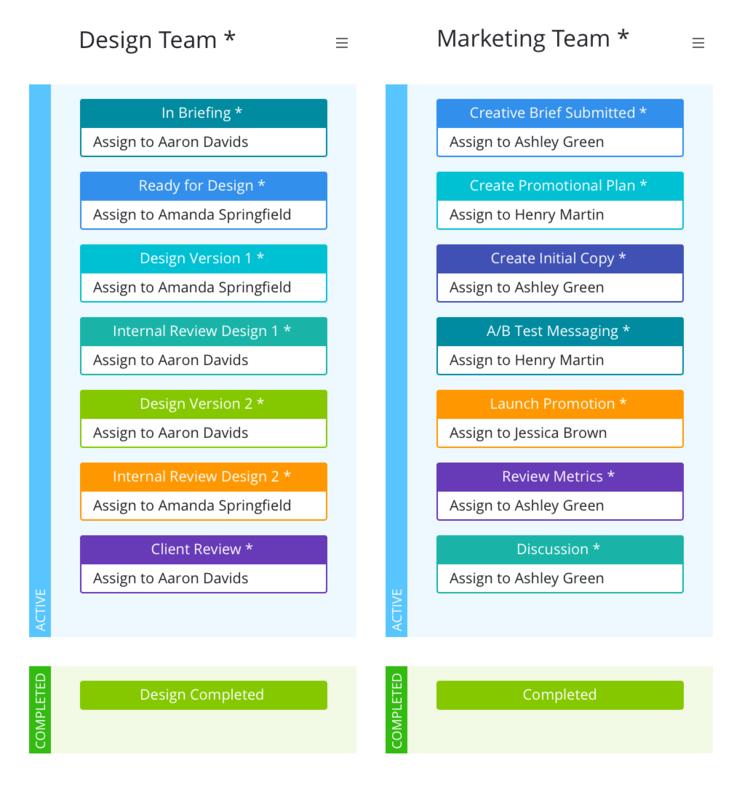 Simplify the management of work with Auto-Assigned Workflows. Eliminate waiting time and help teams focus on delivering active work as quickly as possible, with the highest level of quality. Set Requests to create Tasks with auto-assigned workflows within a designated folder or a Project from a Template. Waiting for feedback and approvals can create a bottleneck. 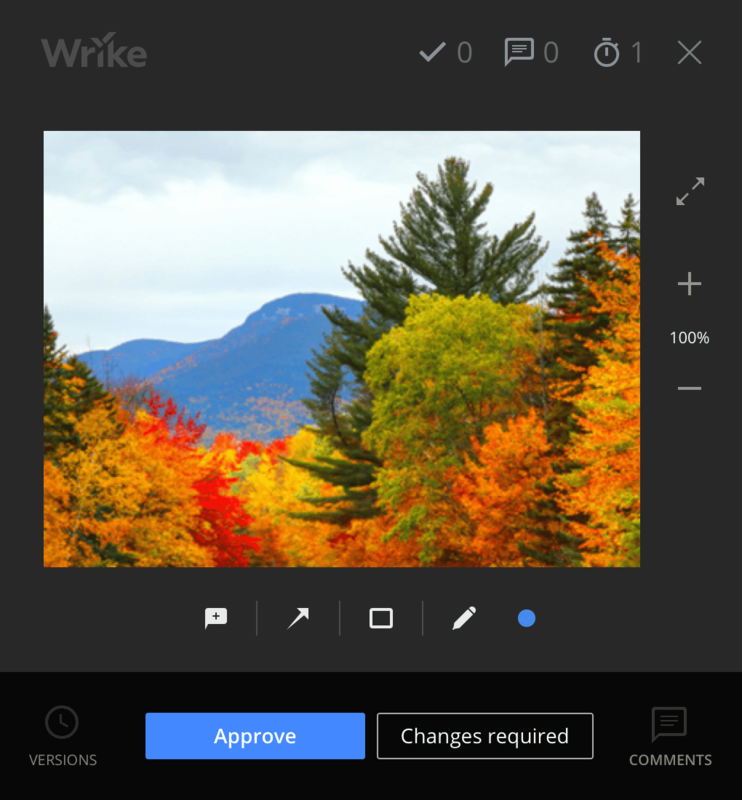 Use Wroke Proof tool to capture all changes in image, video or document files. It's easy for reviewers to edit files on laptops or mobile devices. Each change and decision is added automatically to the Task or Project comment stream for quick scrolling, ordered chronologically. * Available as an add-on to Business, Enterprise and Wrike for Marketers plans. Start a free 14-day trial now. Timing is everything. Waiting for assignments, and not knowing about a problem at a critical time can slow down projects and increase costs. Our 'Start Next Task' notification alerts assignees when prior dependencies have been completed, and they can start their work. In-Product notifications alert you to potential schedule conflicts between Parent Tasks and Subtasks. Daily @ mentions summarize conversations waiting on your response. Make sure Reports are reviewed regularly. 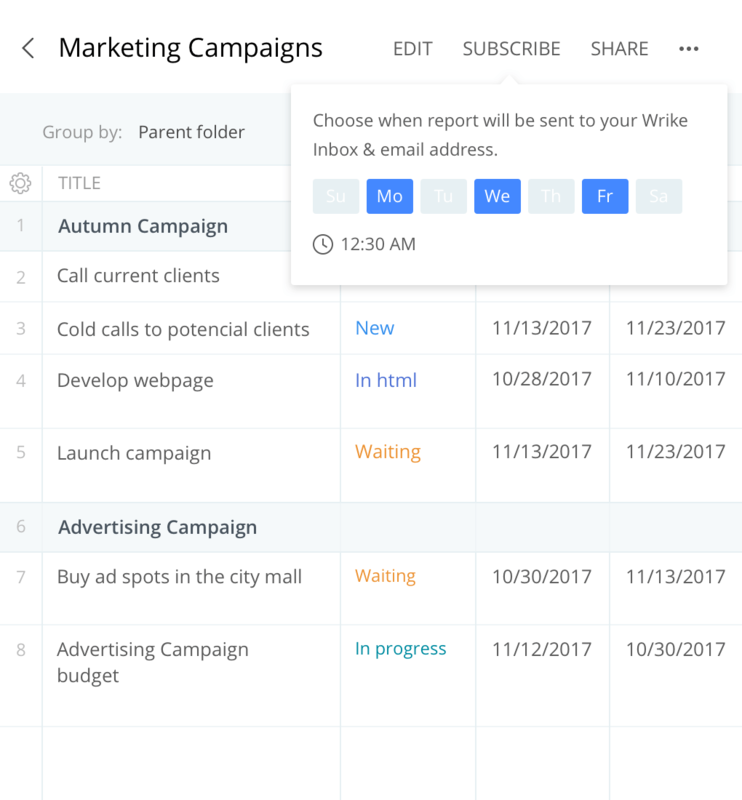 Share Table and Chart Reports with teams, executives or customers, and subscribe to scheduled notifications daily, weekly or multiple times per week. When Inbox & email conversations contain key changes and decisions - don't lose track. 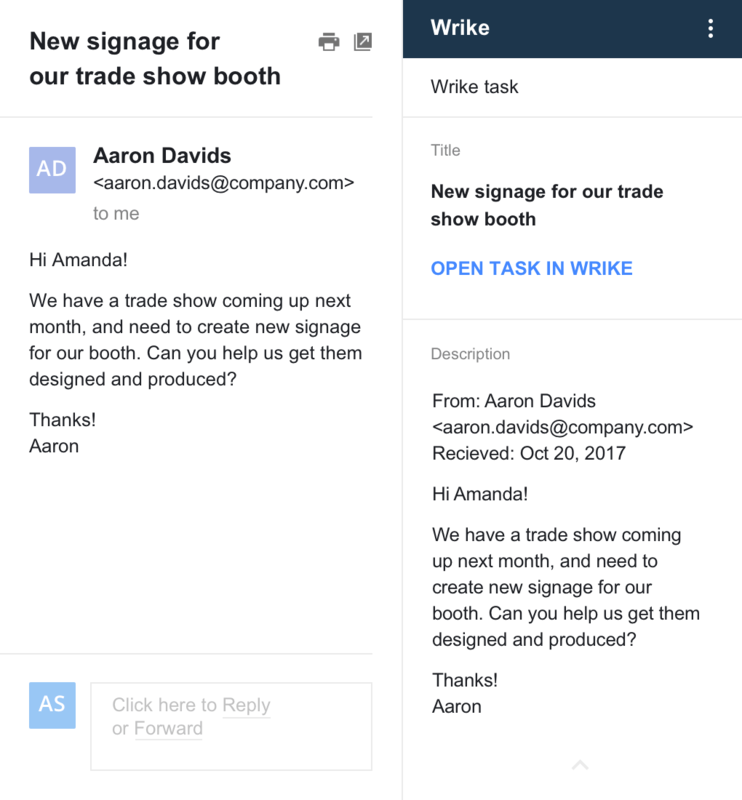 Easily add them into Wrike by using Wrike for Gmail and Wrike for Outlook add-ons to create, assign, and schedule Tasks. 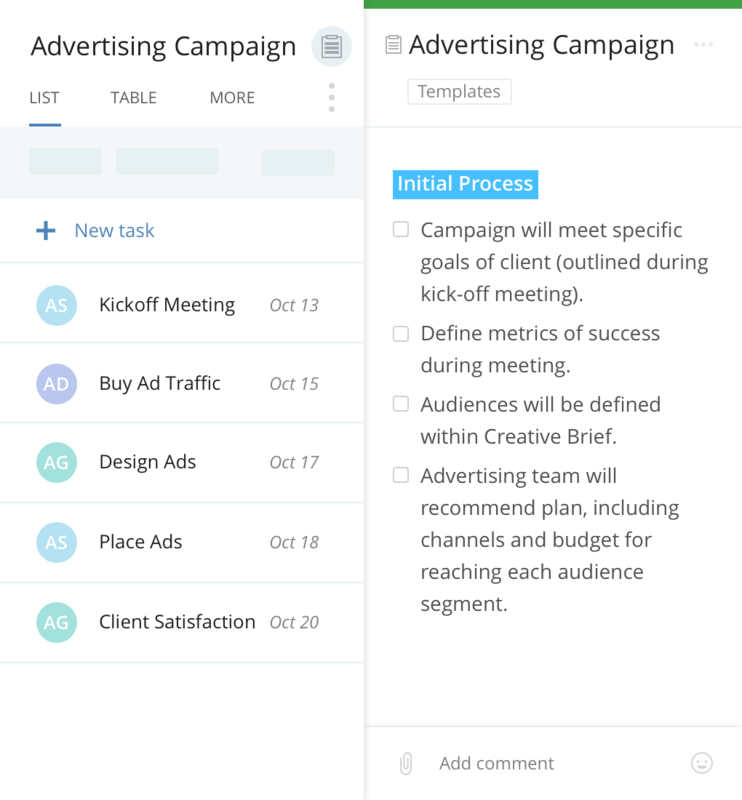 Or, simply Bcc Wrike Tasks or Projects on emails to quickly integrate content into the comment stream. 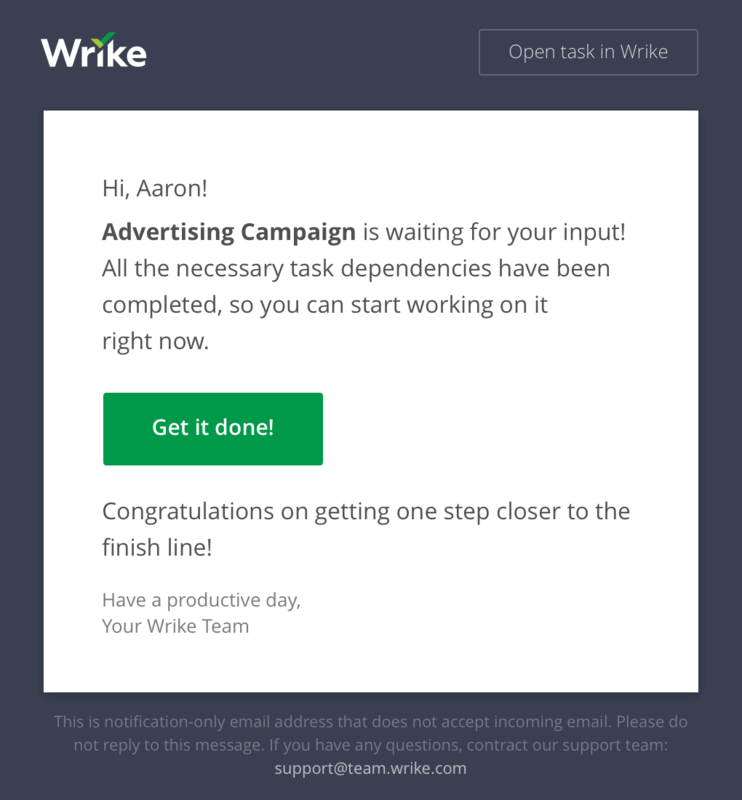 Use Wrike for Slack to turn IM conversations into Tasks using a quick slash command and dialog box to create, assign and schedule all in one step. Email and IM content becomes searchable in Wrike. 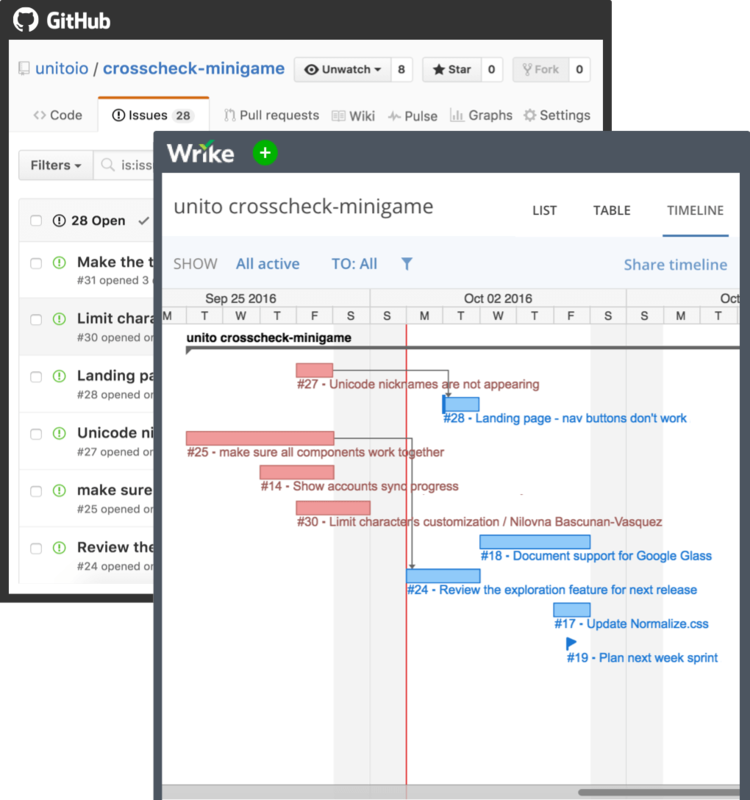 Connect Wrike with JIRA, Github or Salesforce providing 2-way syncs with each system. Connect with Google Calendar for a 2-way sync of event dates and times. Use 3rd party connectors Zapier or Workato to connect to other systems, and the Wrike API for a customized approach.